Its getting towards the end of my beekeeping year and as well as sorting out the bees for the winter I am also trying to get my ever expanding collection of beekeeping equipment in order. Whilst moving the honey supers and spare brood boxes to get them ready for branding (see previous blog entry on hive security) I realised that I had now got a new problem. I had stored all the unused brood and honey boxes with their dry combs inside with sheets of newspaper in-between each box and I didn’t use any chemicals to protect them. This was the same procedure that I followed last year and I didn’t have any problems with wax moth, but then I wasn’t trying to store quite as much comb off the hives and over the winter. The wax moth is most active in August and October and will lay eggs in the hive given half the chance. 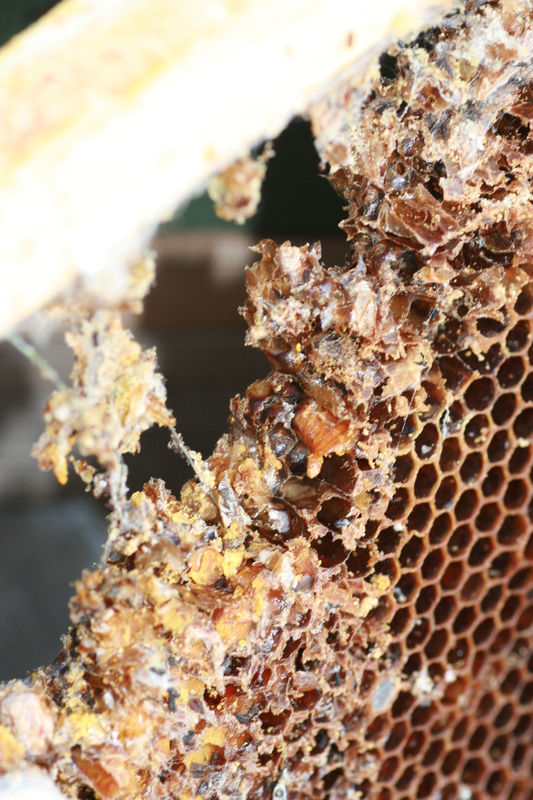 I had seen some evidence of this earlier in the season as the worker bees had uncapped some of the sealed brood – a problem in itself called baldbrood. Wax moth larvae will not be tolerated in the modern hive by a healthy strong colony but they will take advantage of stored brood comb, such as mine. 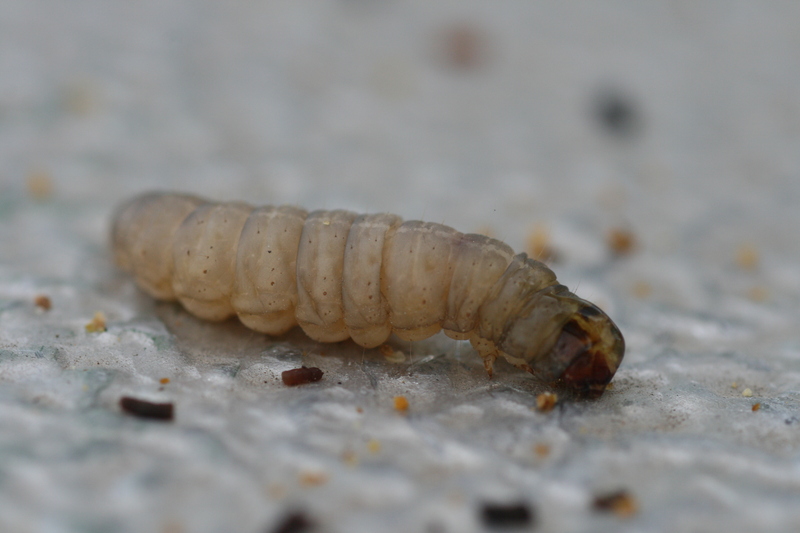 If you find you have a hive over run by wax moth it is likely that there are other problems stressing the colony that has prevented them from evicting these unwanted visitors. Once the larvae are fully grown, having destroyed the comb, they burrow into the woodwork of the hive to start their pupa stage causing further damage. 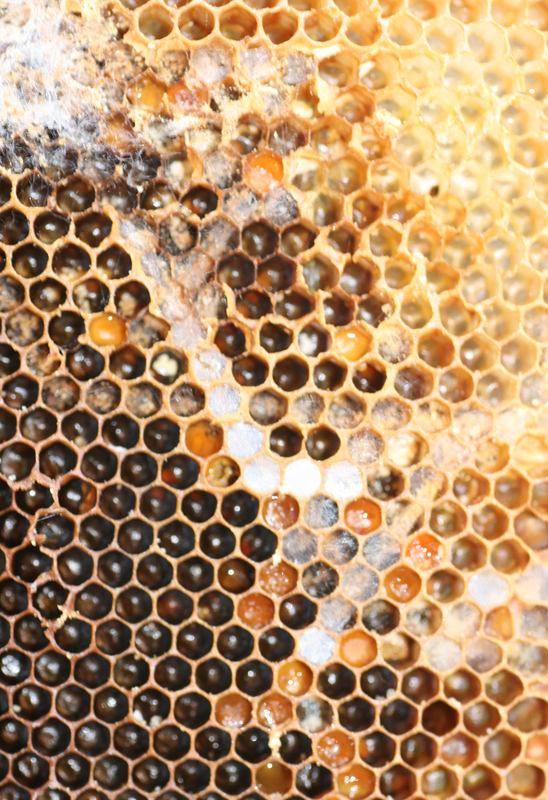 The larvae of the wax moth eat the cocoons, or linings, in the brood comb and this would happen in feral or wild colonies and would help to remove the unused or diseased comb from the cavity that the bees were occupying so would actually benefit the bees by removing old comb and therefore creating more space for the bees to create fresh comb free from disease and parasites. Luckily for the beekeeper they do not pose such a problem to the comb in the honey supers as this has not held any young and this is one of the beekeepers more valuable assets as it allows the bees to store honey as soon as the nectar flow starts each year without having to spend time and energy (and honey) drawing the comb from scratch. As you can see from the photos the comb was totally destroyed so it has now all been cut, from the frames which in turn have been cleaned in washing soda, the brood box itself has been flamed with a blow torch (paying particular attention to the corners and any crevices) so hopefully this will now remove all traces of the wax moth. I asked a retired NBU inspector what was the best way of storing brood comb over winter and he replied ‘you don’t!’. If it is brood comb you don’t store it as it is far better to put swarms direct onto fresh foundation and let them draw it out. 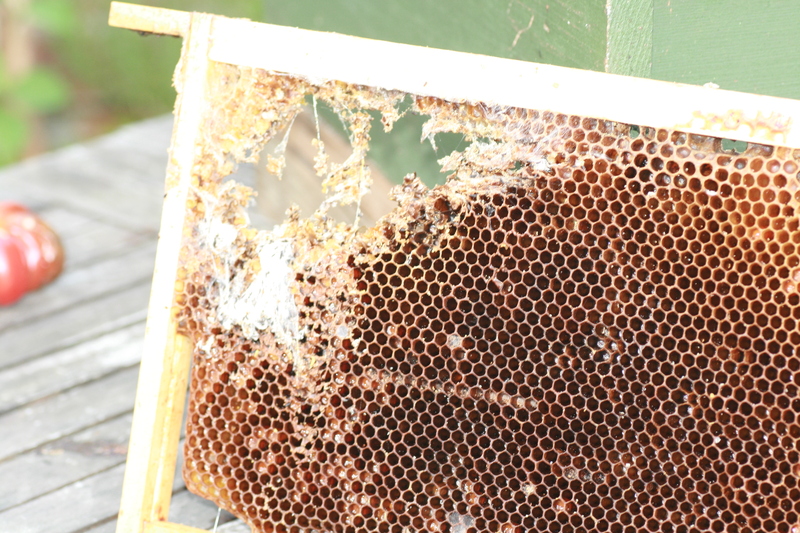 If they are a swarm collected from an unknown origin then they will use the honey in their honey stomachs up producing wax for building comb rather than storing it in ready drawn comb and this can help prevent the spread of disease. When not in use stack the brood boxes and supers withtheir comb outside with queen excluders below and a raised clearer board on the top to allow ventilation and of course a roof to top it all off. Spiders will enter the stack and happily eat any moths that enter. Hope for a cold winter as when you get a frost the temperatures will kill all wax moth and their eggs in comb and frames . Do not use mothballs or chemical that can taint the wax and eventually end up in the honey – if you do this and it is detected you will be in line for a hefty fine! I’ve never seen damage to comb from wax moth, thanks for sharing these photos. Do you do a shook swarm or bailey comb exchange in spring to renew all brood comb for the year. Like everything in beekeeping, every beek has a different answer!